After hundreds of students and locals were poisoned in six towns and in one of the cities in Surigao del Sur as reported on July 10, the candymaker had been identified and her permit has been suspended. Wendy’s Durian Candy had its permit suspended due to the said poisoning incident, however, the candy maker denied poisoning the candies. Acting mayor Paolo Z. Duterte had already ordered the business permit to be suspended by the city's business bureau which causes its Food and Drug Administration (FDA) clearance to be canceled. Duterte said that the manufacturer should stop making candies to avoid making the situation more complicated. The manufacturers claim that their candies are of high quality and that the man who had sold the candies in schools had repacked them and potentially poisoned the said candies. Duterte said that the manufacturer should prove its claim. The poisoning was massive and the public health was endangered. John Dequilla was arrested after people identified him as the man who sild the candies in schools. The manufacturer claimed that the candies were mass produced and they were sent to Dequilla in good quality. They were sold in bulk to the vendor on July 8. The notice of suspension is due to be served on July 13, pending the issuance of its FDA clearance. The suspension can be lifted only when the manufacturer provides the FDA certificate. 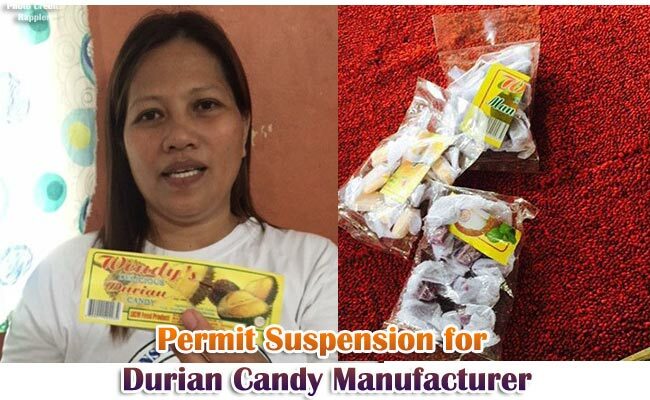 The Wendy;s Durian Candy manufacturers started making candies since 2011 but had not secured an FDA certificate. They had a Temporary Authority to Operate (TAO) but the FDA permit was never acquired. Vice Governor Santiago Cane Jr. of Agusan del Sur said that Wendy’s must be held liable with the poisoning incident as they did not have the FDA permit to start with.